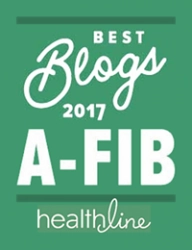 Since 2002, Atrial Fibrillation: Resources for Patients (A-Fib.com) has been the independent and unbiased source of well-researched information on current and emerging Atrial Fibrillation treatments, resources and medical innovations―all written in plain language for patients and their families. 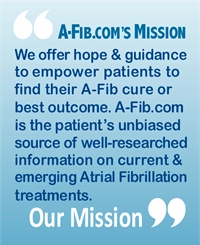 The A-Fib.com mission is to offer hope and guidance to empower patients to find their A-Fib cure or best outcome. 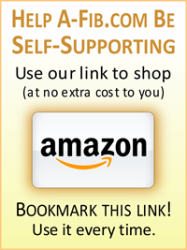 You have our permission to post any of our informational documents, in whole or in part, as well as our photos and graphics on your website, blog, or in your print publication. 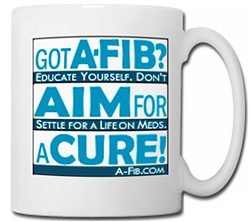 We do ask that you credit us and include our website address and/or a link back to the A-Fib.com website. 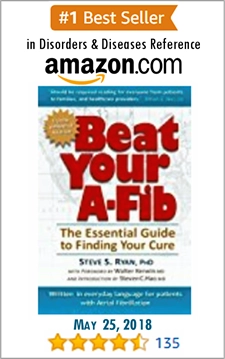 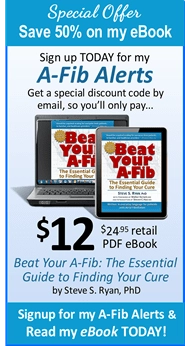 • For the facts, visit: A-FibFacts.Info our companion site; Or download our FREE A-Fib Facts Report (PDF file), or read the report online at our BeatYourA-Fib.com book site.